In an industry in which advanced features are becoming more and more in demand in not just the top end of the product line, but instead in every level of product, there has never been a louder call for a product like the TouchMix-30 Pro. Advanced digital mixing, with professional features and capabilities, but encased in an affordable and user-friendly device. 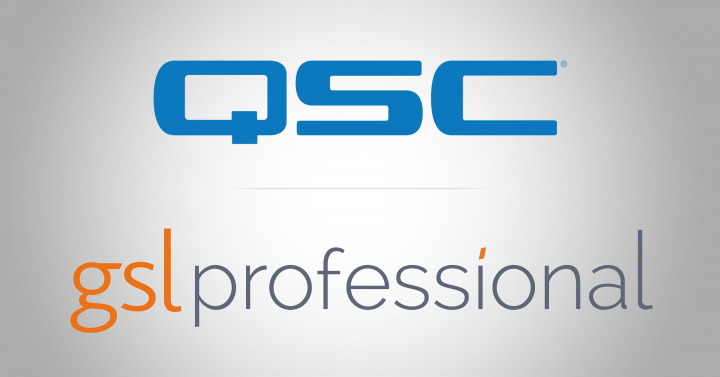 But of course, with a loud call, comes multiple responses, meaning that QSC’s newest addition to their TouchMix range of digital consoles enters an area of the market in which it faces fierce and varied competition. Let’s start with the product’s namesake, it’s 10-inch multi-touch touch screen. 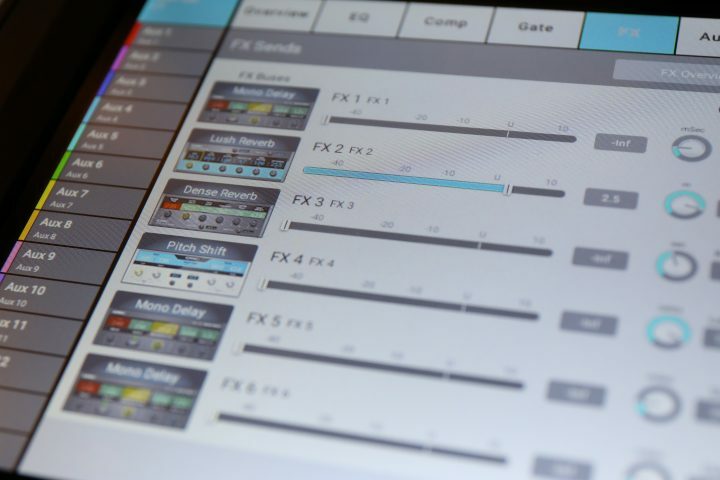 Unlike other compact digital mixers on the market, where the display is merely a reference point and visual element, this screen of the TouchMix-30 pro is the main element of the user interface. As with the QSC TouchMix-16, most of the functions of the consoles are accessed directly from this screen, with multi-touch allowing for a much more natural approach to interaction with the product. Aside from the screen, the unit is compact and well defined across the board. All connections (with the exception of an easy to access headphone and stereo in port) are located to the rear of the mixer, allowing for a clean and presentable appearance up top. Here on the back, we can find 24 XLR inputs, 14 XLR auxiliary outputs, as well as stereo main mix and monitor XLR output pairs. There’s a dedicated XLR input for talkback microphone, as well as four pairs of jack inputs for stereo input to the console. There’s also the option for 3 stereo aux outputs, one as a dedicated headphone out (also on top of the console) and another two that mirror auxes 11/12 and 13/14. Finally, we have our digital connections. 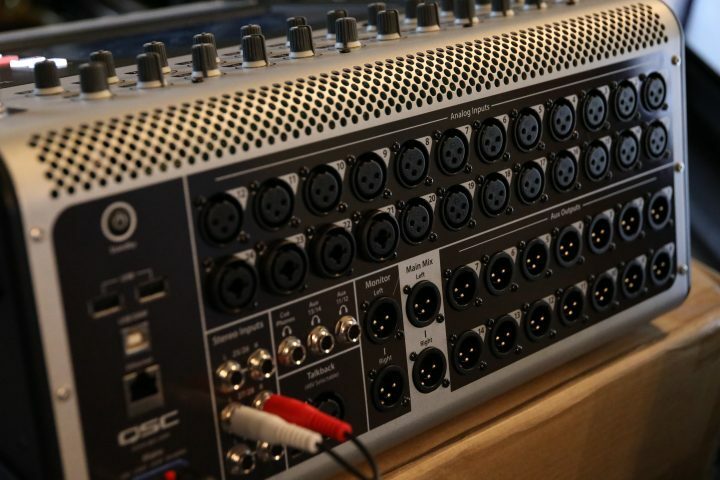 We have two USB inputs, as well as the main USB DAW Output, which is capable of transporting 32×32 channels of audio. Across the top of the mixer we find the gain controls, which almost stand tribute as a reminder that the mixer features 24 Class A Preamps. To the right of the screen, we have eight user-assignable buttons, 4 to the top of the section, and 4 surrounding the large multi-function encoder. Although the mixer doesn’t feature any physical faders what so ever, those who still long for that physical interaction will be impressed by this large encoder. It gives a real tangibility to control of aspects such as levels, EQ parameters and FX settings, to mention but a few of its controllable aspects. 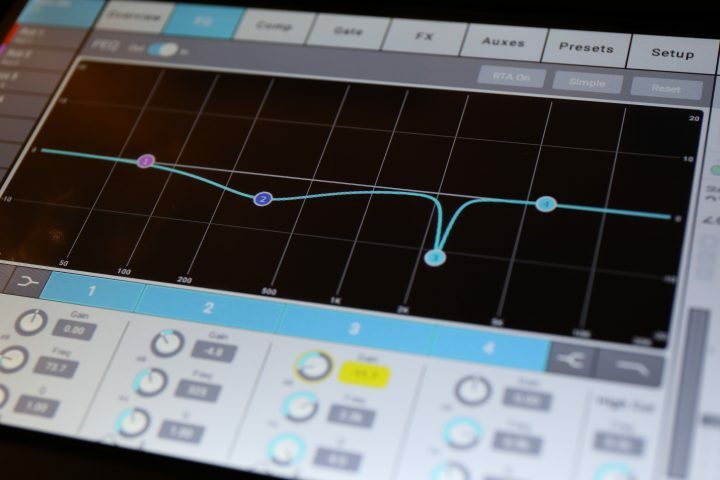 To add to the level of fine-tuning that can be achieved, pressing the encoder allows for fine control, meaning the user can really home in on that perfect sweet spot with accuracy and precision. We also have assignment buttons, again to allow for encoder control of various other functions such as headphone and monitor level. Other quick access buttons allow us entry to handy functions such as phantom power control, auxiliary channels, top-level menus, home screens and DAW control. Going back to the touch screen, which is of course the most important element of this console, the user interface is friendly and intuitive, with a good level of design attention to the general user interface clearly evident. Menus are easy to navigate, and do not take long at all to become well accustomed to, something that’s really important when almost all of the consoles functions and capabilities are accessible directly from this user interface. 32-channel direct-to-hard drive record/playback – capture and recall performances without the need for an external computer. Over 120 live instrument, microphone and other audio source presets created in live environments provide mix-ready channel settings. For testing of the TouchMix-30 pro, we utilized the console for a number of events, in order to get a real taste of how this unit performs in a variety of disciplines. These ranged from basic corporate functions, with a number of wireless microphones (both handheld and lavalier), to full musical performances with numerous musicians on stage. As with all digital consoles, there is one word that is really important to remember when approaching it for the first time. Preparation. Whereas it may be far easier to walk up to an analogue mixer for the first time and be able to navigate it almost instantaneously, this certainly isn’t always the case with digital consoles. It’s important, especially for those who know they are going to be working in a fast-paced and high-demand environment, that any sound engineer familiarises themself with a digital console before use. That said, thanks to the TouchMix-30 Pro’s intuitive user interface, it really didn’t take too long at all to feel confident on this device. The first outing for the desk was a corporate function. Nothing too demanding, but nonetheless an event where quick intuitive control of EQ and compression was essential. On a purely physical level, the spacing of the connections on the back made for easy setup, and the compact footprint of the console made for a clean and non-intrusive presentation, something essential when working in a high-profile corporate environment. With 8 wireless microphones on stage at one time, in a fairly confined space, the ability of fast access and control of faders and EQ parameters was always going to be the defining factor of success. The menus allow for fast navigation, and the encoder gives a nice tactile approach to what is essentially an almost completely touch-screen mixing experience. It’s worth mentioning that it does take a little time to get used to the encoder control, and one wonders whether the inclusion of just one large, multi-function fader would have appeased the wishes of those approaching this console from more “traditional” means of mixing. But, that said, this mixer doesn’t aim to fit tradition, and instead presents a new approach to mixing for a new generation of engineers. So, let’s move on to the consoles biggest test, working as FOH console for a performance with multiple bands. It must be said, that never in my time working as an engineer have I had so much intrigue over my mixing console from the musicians I’ve been working with as I experienced with the TouchMix-30 Pro. It’s certainly a head-turner, even for musicians who are now very accustomed to working with digital consoles, the comment of “where are the faders? !” was one that made an appearance multiple times throughout the evening. As knee-jerk a reaction as this may seem, it results from a very real concern that many users may have when approaching a console of this type for the first time. When we speak about the touch-screen of this unit, the fact that it is multi-touch, and has software that is well designed to work with multi-touch, is of unrivalled importance. 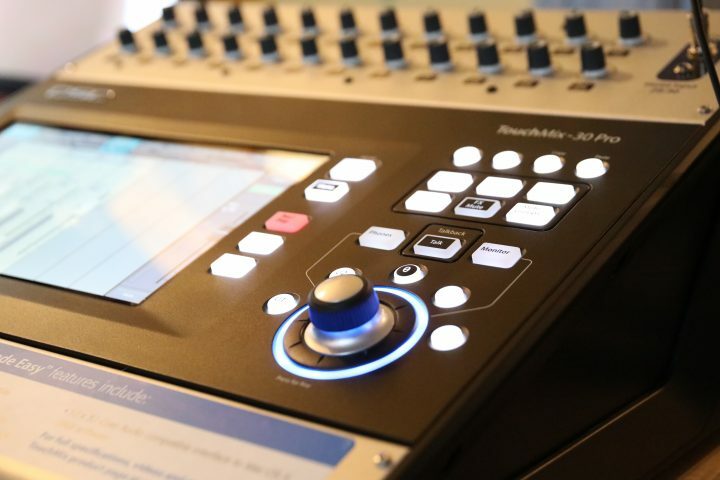 Every engineer will tell you the importance of being able to control multiple faders at once, and this is something that the TouchMix-30 Pro really has nailed down. Yes, it’s all very well being able to setup sub-groups and have single fader control over a number of elements of the mix, but that seemingly simple ability to take two fingers and push up two parallel faders at once, is something that makes the experience so much more comfortable. Achieving a basic mix is easy and enjoyable, even before we look into the multitude of additional features that make this console a joy to mix on. FX wise, this console is ready to rock straight out of the box. These days, its fairly common for a product to have something splashed across the side of the box, bragging about the numbers of presets it has ready to spring into action. So when QSC claims that this console has 120 of these presets created in “live environments providing mix-ready channel settings”, it’s easy to be dubious. However, as with their description of the user-friendly touch screen, QSC have hit the mark spot on, and the presets that are shipped with this unit really are fantastic. Ranging from common reverb and delay options, right up to more intricate EQ settings, I went from cautiousness to enthusiasm as soon as I’d applied a few of these presets to my mix. I was working with in-ear monitors for this gig, so the ability to have 14 auxiliary channels in a console with such a compact footprint was a real bonus. 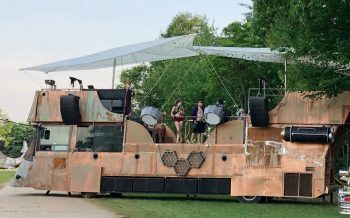 The ability to easily send the musicians on stage exactly what they wanted in terms of monitoring was liberating, and something that multiple musicians from the concert made positive comments on. The final element i’d like to discuss is the connectivity between the TouchMix-30 Pro and an iPad or iPhone. Connecting with one of these devices gives two options with the console, either a remote control option, allowing the user to control their mix wirelessly from anywhere around the venue, or as an additional screen, giving even more control over multiple elements of the mix at any one time. For our testing, we focussed on using the device as an extension of the main console screen, which is something that really does enhance the experience of mixing with the unit. Another really exciting possibility is the ability to connect a smartphone to the console, and allow control over auxiliary mixes. What does this mean in the real world? No more awkward hand signals mid-gig from the lead singer on stage as he or she tries to signal to the engineer that he/she wants more guitar in his monitors. 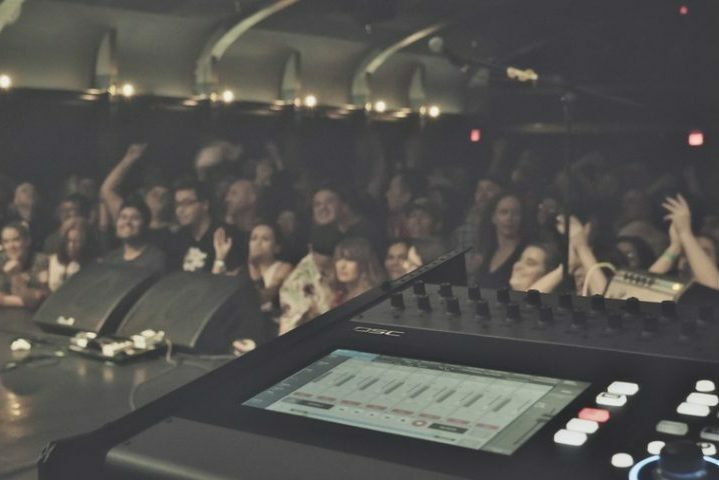 A smartphone device on stage could provide performers with individual access to their own monitor mix, something that really has the potential to grow with more and more performers wanting to take control over their own on-stage experience. For a console that is entering such a competitive section of the market, the QSC TouchMix-30 Pro really does fight its corner. Entering at such an affordable price-point, it makes no sacrifices on advanced features, build quality or software design. As with any device that is so heavily reliant on a touch screen interface, the effectiveness of the relationship between the screen and the user-interface behind it is of paramount importance, and this is something that QSC really have got spot on with this console. Navigation through the multitude of options and features is intuitive and fast, especially with the addition of an external screen on your tablet or smartphone. Yes, it may take some getting used to, and this may not necessarily be the easiest console to transition to from an analogue setup, but for those users looking to enter into world of digital mixing, this really is an incredibly attractive proposition. 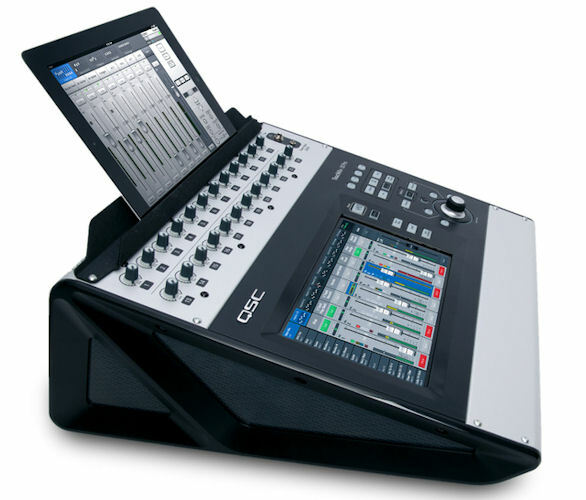 For a new generation of mixers and engineers, those who have grown up in the digital world where tablets have replaced books and screens replaced keyboards, the QSC TouchMix-30 Pro is an obvious and familiar choice.